ME Connect – Here to listen. Here to help. 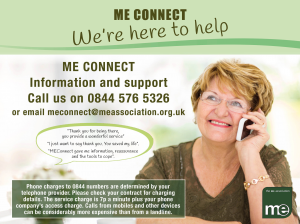 The ME Connect telephone helpline is available every day, during the hours of 10am-12noon, 2pm-4pm and 7pm-9pm. Our helpline can receive a large volume of calls, so if you can’t get through immediately, then please hang-up and try again later. Or you can contact us by email at any time, and we will respond as soon as practicable. *Our helpline can receive a large volume of calls, so if you can’t get through immediately, then please hang-up and try again later. 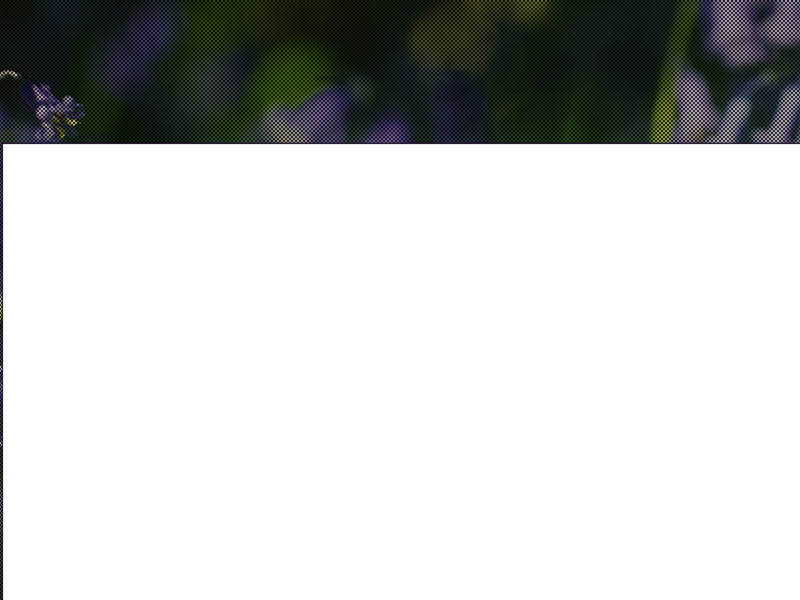 **We are a small medical charity and we do not have the capacity to answer long or complex questions relating to medical management, DWP benefit disputes and legal problems. 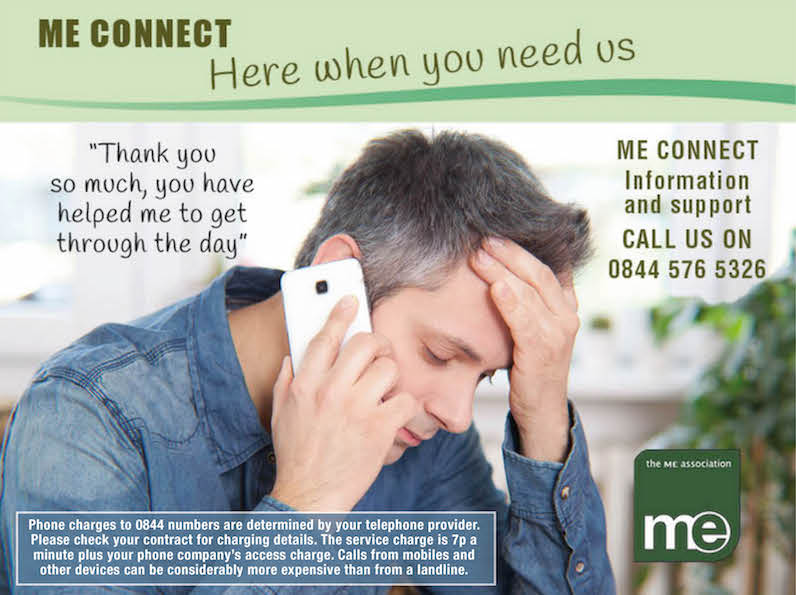 The ME Connect email service provides information and support and, where appropriate, signposting to further sources of help or information. ***All communications are treated in the strictest of confidence. Phone charges to 0844 numbers are determined by your telephone provider. Please check your contract for charging details. 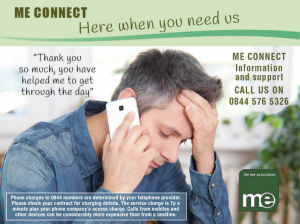 The service charge is 7p a minute – from which the ME Association receives 3p – plus your provider’s access charge. Calls from mobiles and other devices can be considerably more expensive than from a landline. If you have a query about symptoms or diagnosis of M.E. then please review the extensive information we have placed in the website section: What is ME? What is ME? also explains the various approaches to management for example, and provides links to all the relevant leaflets that can be ordered or downloaded from our website shop. We have also now published a Factsheet about M.E. that is available as a free download and can be helpful when explaining M.E. to others. 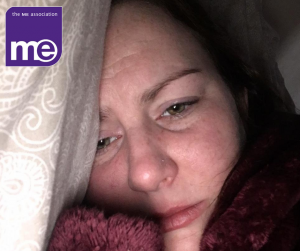 “You might get someone saying: ‘I’ve rung up, but I’m not sure what I want to say,” explains Hilary Briars, Manager of ME Connect. Sometimes the caller needs someone to talk to, a listening ear. After all, as well as the physical illness, M.E. brings a bulging suitcase of unwelcome emotional baggage; isolation; guilt; anger; frustration – feelings which are hard to express. Other times, it’s practical support. Just one of the many images from the Real M.E. campaign. The line started as the Listening Ear service. It was revamped in the early nineties, when Hilary, who herself has ME, took over as manager. It is now open every day of the year, and is staffed by a fully-trained team of volunteers. 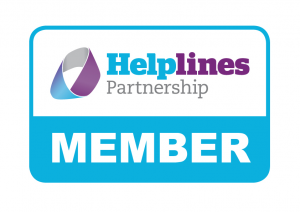 “And there is also an ME Connect email, for those who find that an easier way of contacting us. These emails go through to the ME Association head office, so I would say that it’s best used for factual enquiries,” she explains. 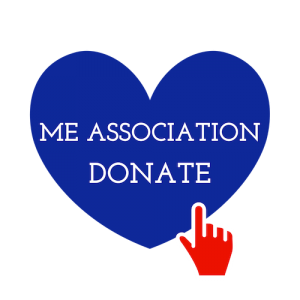 Here to help anyone who is affected by M.E. “When people call us for the first time, they may be nervous, or not sure of what we can offer. “We try to put them at their ease, and tell them to take their time.